Would you like to create shapes like this in PowerPoint? I like them because they look informal, hand drawn. They don’t come with PowerPoint, but you can easily create them using the Bézier Curve (Edit Points) feature. This feature is not well known because it isn’t on the ribbon. You do everything with the right-click menu. In this short video, I show you how to create these shapes. On the Format tab, choose Shape Fill, No Fill. Right-click on the outline and choose Edit Points. Right-click the top point and choose Open Path. I have more information on Bézier curves in this tip: Create Bézier curves. You always have new and interesting ideas to give us. Thanks. Thank you so much for what you create in the world. 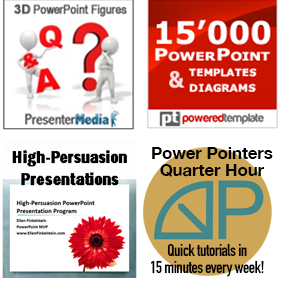 Making power points more powerful and useful is a tremendous gift. I am learning every time I go to your website and study the hints and instructions. It’s a fascinating field and sometimes the very fact that I can do something novel is a temptation away from creating text for teaching 🙂 and writing down ideas. I was searching for exactly this and found your article. Great tip, worked perfectly, thank you! Hi, thank you for this lesson, very useful.